When riding your bike, you may benefit from using a bike computer, recording your speed and the distances you have cycled. The bike computer is attached to the handlebars of your bike, while sensors acknowledge your activity on your bike, customizing your experiences and tailoring to your needs. While all bike computers measure speed and distance, it is also possible to acquire a bike computer which measures calories burned as well as measuring the temperature. Furthermore, some bike computers are able to receive smart notifications and live interactions, maintaining your social interactions as you ride. We have reviewed five of the best bike computers currently available on the market, enabling you to find the best bike computer for you and your needs. The CAT EYE Padrone Wireless Bike Computer is available in seven different color choices, including bright pink, tangerine orange, electric blue or neon green. Alternatively, you may prefer a pure white, or a sleek black. Our favorite, however, has to be the stars and stripes design to embrace our patriotic emotions. The bike computer displays your average speed, your current speed, and maximum speed, the total distance traveled and a clock function. Additionally, you can manually set the odometer as well as using the base of the unit to choose your desired functions. 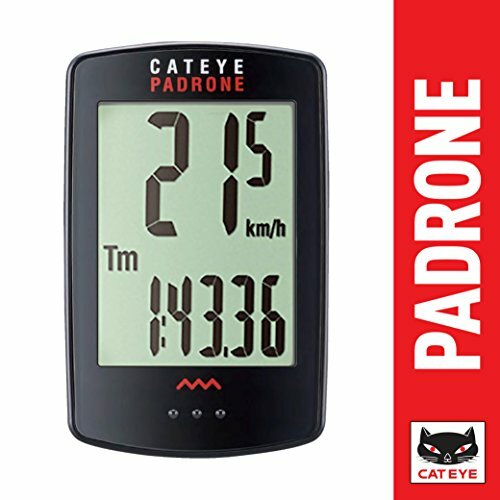 The CAT EYE Padrone Wireless Bike Computer can be attached safely to your bike with the FlexTight bracket, and the computer knows when you have stopped and makes adjustments to your times and distances traveled. This bike computer weighs 3.2 oz. 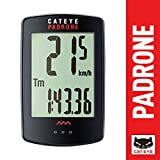 Why We Liked It – The CAT EYE Padrone Wireless Bike Computer is a great functioning item to record your speed and distances, tailor-made to you. The choice of seven color designs further provides your bike with a touch of individuality as well as looking great. 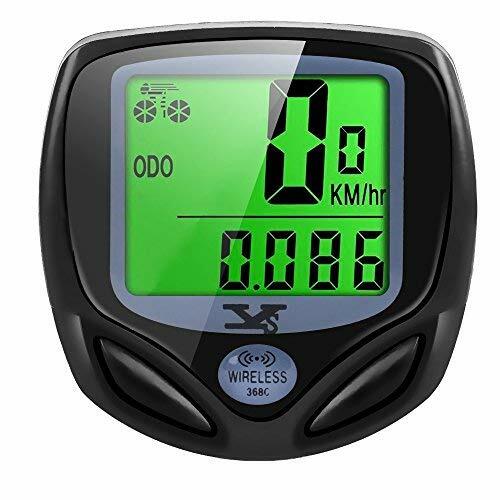 The SOON GO Bicycle Speedometer Wireless Bike Computer comes in a sleek black design and clearly displays accurate speed tracking. 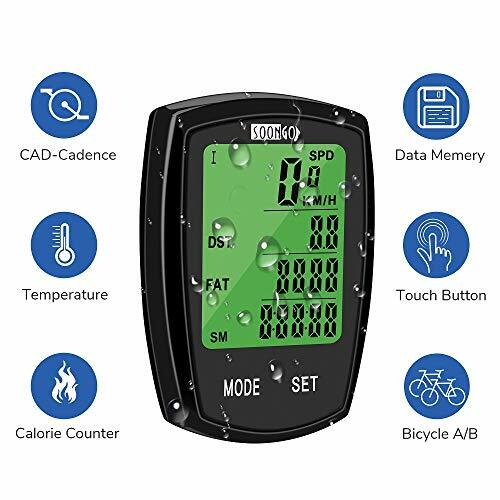 The Cadence sensor provides readings for RPM, pedaling rate, temperature, and calorie counter, offering an adjustable and waterproof backlight to suit all weather conditions and climates. The bike computer provides easy installation and operation, ensuring that instructions are easy to follow with a video link included with your purchase, making sure that you get the most out of your bike computer. The addition of a calorie counter is a great feature, helping you with your fitness plan or your competing stats. The SOON GO Bicycle Speedometer Wireless Bike Computer weighs 3.52 oz. Why We Liked It – The SOON GO – Bicycle Speedometer Wireless Bike Computer provides the usual features required in a bike computer, such as speed and distance, in addition to the extra benefits of measuring temperature and calories, providing an all-round advantage to your cycling as well as your lifestyle. Furthermore, the installation instructional video link is a perfect feature to ensure that you use the bike computer to its full capability. The SY Bicycle Speedometer and Odometer Wireless Bike Computer is available in a modern black design with a bright neon green backlight, enabling you to easily view the readings even in the dark, automatically turning on between 6 pm and 6 am. Installation is simple, with two buttons present to access all features, while the casing is durable and hardwearing. Measurements which the bike computer will provide include distance, riding time and riding speed, offering waterproof capabilities and allowing for customizable settings. The SY Bicycle Speedometer and Odometer Wireless Bike Computer weighs 4 oz and automatically wakes from sleep mode once it senses vibrations within the saddle. Why We Liked It – The SY Bicycle Speedometer and Odometer Wireless Bike Computer offers some great features, such as automatically turning on the backlight during the predicted darker hours as well as waking from sleep mode once the bike computer senses vibrations within the saddle. Additionally, the neon green backlight ensures that you can always see the readings clearly, regardless of the weather conditions or the tome of the day. 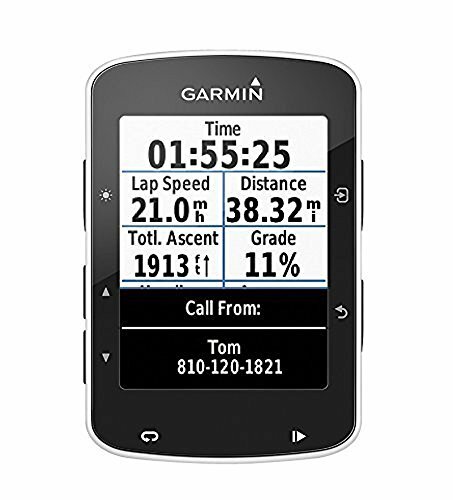 The Garmin Edge 520 Bike GPS is available in a modern black color choice, with or without a remote control. Through Strava live segments, you are able to access in-ride challenges so that there is never a dull moment. Recordings include cycling specific VO2 max in addition to recovery time when in collaboration with the heart rate and power. Features include tracking functional threshold, live tracking, smart notifications, social media sharing, and weather. You can also team up your device with ANT+ sensors to display data effectively. The Garmin Edge 520 Bike GPS weighs only 2.08 oz, yet provides some fantastic advantages to your cycling ride. Furthermore, it is additionally possible to set up for multiple bikes. Why We Liked It – The Garmin Edge 520 Bike GPS can improve your cycle ride immensely, utilizing social media sharing and smart notifications so that you can keep in touch on the go. You can also access live weather reports so that you can plan and alter your cycle route dependent on weather conditions. The CAT EYE Velo 7 Bike Computer Speedometer displays readings for current speed, max speed, and average speed in addition to the total distance and trip distance, elapsed time and a clock. The bike computer knows when you have stopped cycling, perhaps for a break or some lunch, and so will automatically cease counting the time and reading speeds. A wired speed sensor is included while the battery will provide you with three years of longevity. 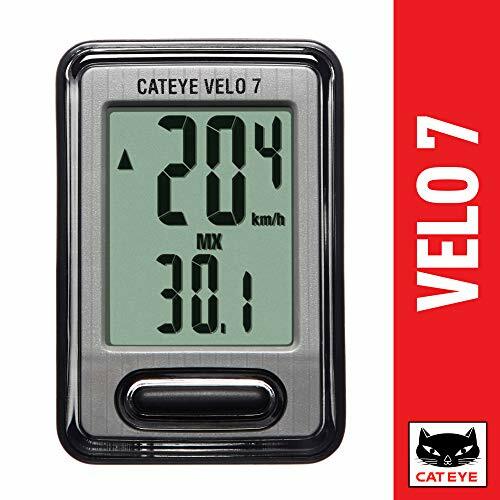 The CAT EYE Velo 7 Bike Computer Speedometer weighs 3.2 oz and is easy to install and use. 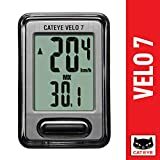 Why We Liked It – The CAT EYE Velo 7 Bike Computer Speedometer provides all of the necessary features required by a bike computer, in addition to a wired speed sensor and an automatic shut off when your bike is not in use. Whether you enjoy a gentle cycle ride on a weekend, a power trail off-road, or competitive training for the Tour de France, cycling is becoming more popular than ever. In order to enhance this experience, a bike computer may be the much-desired cycling accessory which you are looking for. A novice rider may find a bike computer an interesting gadget, recording your riding speeds and distances in order to push yourself to the next level. However, a more experienced rider may find that a bike computer actually helps their performance, enabling you to assess your weaknesses and areas for improvement. Taking measurements accurately as you ride will provide you with the readings needed to see how well you are actually cycling. All bike computers will measure your speed, and your distance traveled, while the more advanced models also measure your maximum speed, calories burned, and your average speed. If you are able to pay more for your bike computer, you may also receive GPS mapping and connectivity, linking your bike to your social media activity and providing real-time weather reports so that you may change your plans if necessary. Q: How much will I pay for a bike computer? A: A bike computer can vary in price from as little as $20 up to around $450. It will depend on the additional features which your bike computer possesses, with the standard bike computers which just read the speed and distance costing a lower amount. The bike computers which contain the best features, such as GPS connectivity, will cost more.